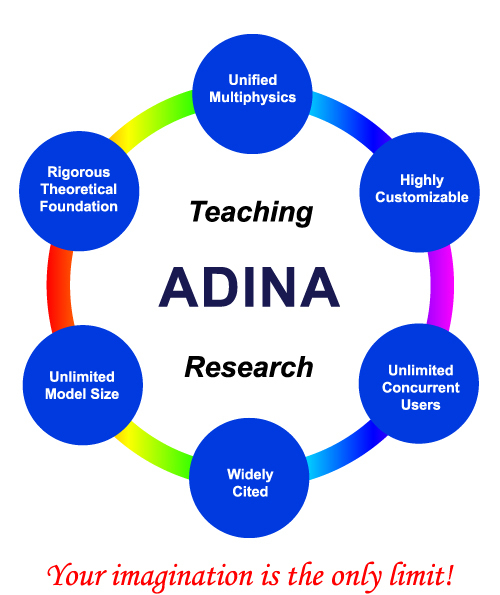 Besides being used widely in industries, the ADINA System is also used effectively in teaching and research at universities all around the world. ADINA offers many attractive capabilities for use as a teaching and research tool. For details of features, see below, or click on the text balloons in the following figure. Unlimited usage of ADINA throughout the university with no restriction on the number of concurrent users, problem sizes and analysis capabilities. The ADINA System can be used to analyze structural, thermal, CFD, electromagnetics, fluid-structure interaction, thermo-mechanical coupling and multiphysics problems. One pre- and post-processor for all analysis types, with solid modeling capabilities based on the Parasolid Kernel (e.g., NX, SolidEdge, SolidWorks) and also the IGES interface. The theory and formulations used in ADINA follow closely the material in the book Finite Element Procedures by K. J. Bathe. Unix version (tar and gzip) or PC version (winzip). ADINA is built upon a consistent and rigorous theoretical foundation. Many publications give results obtained using ADINA, providing a rich resource for users looking to apply ADINA in both traditional and innovative applications. A 900 nodes version of the program is provided that can be freely distributed to students to be used on their own personal computers. No password is required to run this special version. More than 200 case studies, illustrating different capabilities of ADINA, are presented in the ADINA Tech Briefs. ADINA allows users to program their own types of loads, elements, and material models, making it a valuable tool for researchers. If you are not yet a user, contact us for a special offer.